After declining again and again, Google has finally accepted that there was a Panda Update. The whole blogosphere was threatened when they decline about the update. Google with the help of Twitter informed the whole blogosphere that the recent fluctuation in the Search engine ranking was due to the Google Panda 23rd Algorithm refresh. The Algorithm affected about 1.3% of English based quires worldwide. We were a bit surprised to see a Panda update before Christmas and New Year holidays because last year they promised that, they will not update Panda Algorithm during holidays. The effect of this update were not that taunting because it hardly affected 1.3% of search queries. 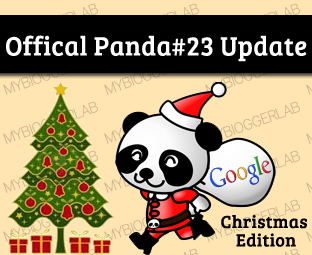 In this article, we will discuss more on Google Panda #23 Algorithm update. There were lots of rumors going on the blogosphere about the Search Algorithm update but Google always decline the rumors. It happened on 5, December 2012 but later it was officially declined by Google web spam team. However, yesterday on 21th of December there were strong reports about the refresh and this time Google had no excuse rather than confirming about the Official Algorithm update. Many people Twitted us asking for the Update but since, we didn’t have any proves. Therefore, we did not write an article on it. However, after Google twitted about the update, we could not stop our self from expressing the joy that we finally win the battle. Google has confirmed a Panda refresh impacting 1.3% of queries! Consider the following screenshot. We have not noticed a foremost fluctuation in the traffic statistics. Since, the update has been significantly smaller. Therefore, its affect are not that treating. In the following screenshot a person may notice a small increase in the traffic, but we cannot say that it is due to the Algo change because it is the end of a weekend where we usually get less traffic as compare to the working days. Finally, we won the battle because Google Confirmed about the Algo change. Algorithm updates are not becoming part of every bloggers like because each and every day we are hearing news related to it. What are your thoughts about the refresh? Does it affect your site traffic? Feel free to leave your comments till then, Peace, Blessings and Happy Blogging. I think that Mr. Faizan Don't likes to give reply to his visitors.....huh. Well, Do you Really Think That. Well, We Should Complain that He Doesn't Reply :) lol. Don't worry! It will be back in few weeks. i asked you previously that i want to put the metro style navigation menu in center position but it always align to left. I loved Panda update, but this time it decreased my search engine traffic. I also love panda up date.